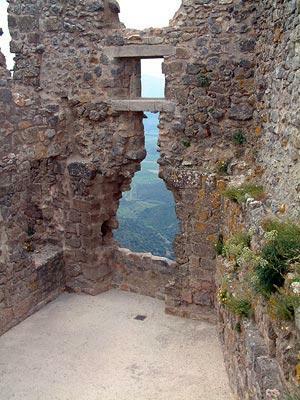 The Château de Quéribus is one of the famous 'cathar castles' of southern France, situated in Cucugnan in the Aude department of the Languedoc-Roussillon region. 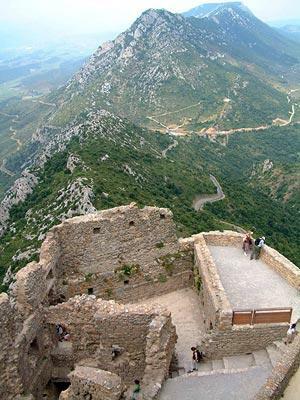 One of the most visited and most dramatically located of the cathar castles, the Chateau de Quéribus stands high on a rocky ridge at 728 metres altitude. With its origins in the 10th or 11th century it is easy to see why this location was chosen for a castle: the position appears more or less impregnable and the views across the surrounding region allow surveillance of a very large area of land. 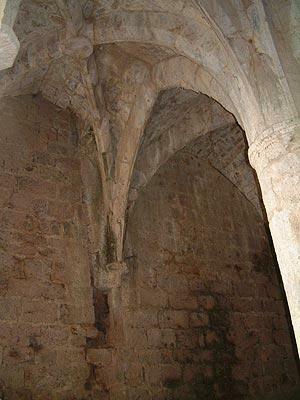 The Château de Quéribus was originally a possession of Barcelona before it as transferred to Aragon and then later to Narbonne at the end of the 12th century, shortly before the crusade against the cathars began. At the time of the crusade the castle was held by Chabert de Barbaira, a knight and supporter of the cathars, who allowed the castle to be used as a place of refuge for cathars escaping persecution. Due to a strong relationship between Chabert de Barbaira and the Lord of Roussillon, the castle managed to avoid the worst excesses of the crusaders. 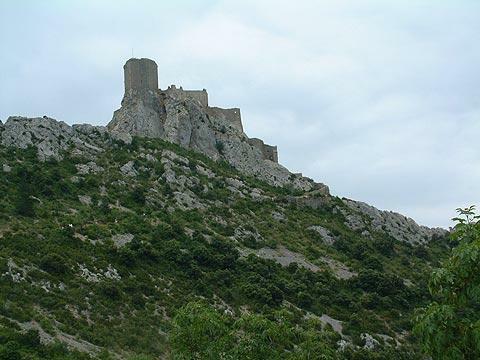 With the death of the Lord of Roussillon in 1241 this protection came to an end, and the castle was eventually besieged and captured in 1255, one of the very last cathar outposts to be defeated. Shortly after, in 1258, the Treaty of Corbeil was signed that established the border between France and Aragon as being a short distance south of the Château de Quéribus and the castle, like the other 'Sons of Carcassonne' castles (Puilaurens, Peyrepertuse, Termes and Aguilar) gained a new use as a fortified castle to control the border. Over the next two centuries the castle was substantially reinforced and retained its control over the border until 1659 when the Treaty of the Pyrenees established a new border further to the south. From this point on the castle was occupied only occasionally and from the time of the Revolution in 1789 it was completely abandoned and fell to ruin. Over the last two decades a large amount of renovation has been carried out at Château de Quéruibus and there is a great deal of interest to be seen during a visit, as well as stunning views across the Languedoc countryside from the castle terrace. As well as the three rings of defensive walls you can see various of the buildings such as the donjon, main hall and water cisterns as well as numerous military devices to allow the castle to defend itself such as arrow slits and walls angled to deflect projectiles. The Chateau de Quéribus is open all year except January, price of admission is 6 euros for adults and 3.50 euros for children up to 15 years old. Although the path to the entrance is quite steep in places it is an easy walk. You will also enjoy a stroll around the village of Cucugnan just below the castle, and the Chateau de Quéribus is only a few kilometres from the Château de Peyrepertuse, also very impressive and popular with visitors to the area. During your visit you can also discover more of the best known cathar castles in France: the Chateau de Quéribus is one of the row of five castles that once protected Fance from invasion by Spain.